featured uninterrupted pop songs with the alternating performances by the Armed Forces Radio Orchestra, Milton Shrednick, Allen Roth, Les Paul and many more. Produced by AFRS, At Ease featured easy listening with pop music of the 1940s. Each show opened with "At Ease and listen to the folk songs of tomorrow" and was followed by a quarter hours of uninterrupted music. Each show ends with the host listing the names of the musical numbers played. The show featured uninterrupted pop songs with the alternating performances by the Armed Forces Radio Orchestra, Milton Shrednick and His Orchestra, Allen Roth and His Orchestra, the Les Paul Trio and many more. 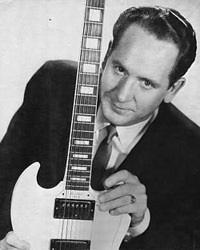 Les Paul played his electric guitar in some memorable guitar solos. Catch up on your favorites, perfect for Sunday afternoon rocking and remembering. See also: Guard Sessions, Battle Stations, Theater of Hits, Voice of the Army, and US Navy Shows. Been a customer for a long time. Keep up the good work.